Larson Electronics offers an energy-efficient solar LED light tower for rental in remote locations. It can be used on locations such as emergency operations, security checkpoints, construction, concerts and military camp sites. The solar LED light mast is equipped with four, 150-watt LED lamps, supported by a 10.7 kW water-cooled diesel generator, eight, 300-watt solar panels and ten, 105aH AGM batteries. The RNT-SPLT-2.4K-LM30-FM-20X105AH-4X30L-10KW-CPR is an effective solution for sustainable illumination in locations without direct access to a local grid. The aluminum light mast with a steel canopy can be elevated from 8 feet up to 29.5 feet. Equipped with six stages, the tower is adjustable (360 degrees) and provides resistance from 40-mph winds. A total of eight, 300-watt solar panels can be used to harvest sunlight, while storing power in 105aH AGM batteries (1,200aH total/600aH usable). An integrated compass offers guidance, when positioning the solar panels for maximum exposure to sunlight. Charge time for the 24V DC system is 9.5 hours, with a runtime of 30 hours and an expected lifespan of 5 to 7 years. Power storage management is facilitated by a 48V DC Morningstar TS-MPPT-600V controller. For high-intensity illumination the RNT-SPLT-2.4K-LM30-FM-20X105AH-4X30L-10KW-CPR features four, 150-watt LED lamps. During use, the luminaries provide 13,000 lumens of white light with a color temperature rating of 5,000K in a flood beam configuration. The LED lights are constructed of die-cast aluminum for durability in outdoor environments. A timer allows operators to automate lighting functions. Backup power is provided by a four-stroke, three-cylinder, water-cooled Stamford PI044E diesel generator with a rated capacity of 10.7 kW (11.8 kW standby). Voltage compatibility includes 120/240V single phase 60 Hz. The fuel tank capacity of the generator is 8 hours. Operators can access a waterproof job box for storing equipment during transportation. Internal cooling fans keep the job box cool to prevent overheating of stored electronics. 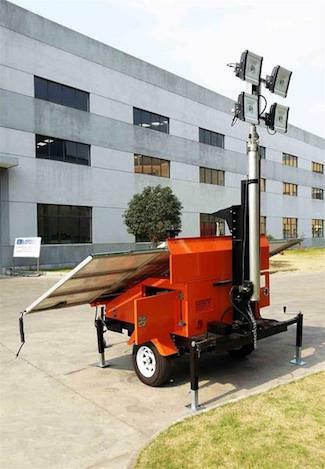 The entire solar LED light tower is skid mounted and secured on a trailer base. Deployment may be completed on the ground without the single-axle trailer. The trailer lights are U.S. DOT compliant and four 1,000-pound outriggers offer support on rugged or uneven terrain. For grid configurations, multiple solar LED light towers can be connected simultaneously.